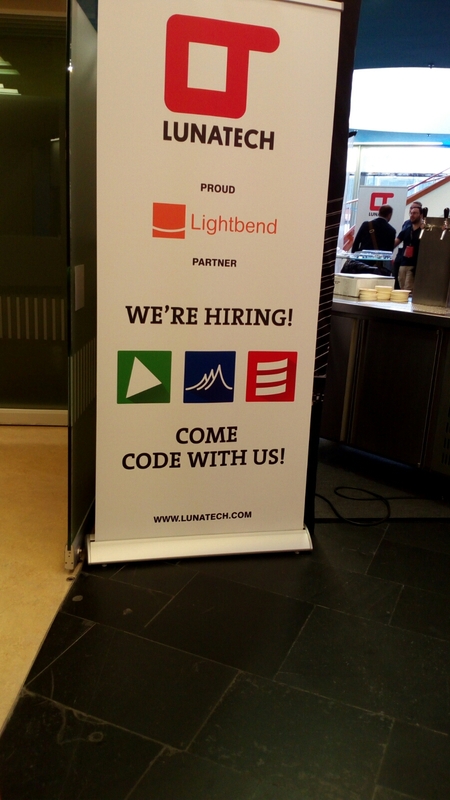 Scala… Where to start? Well I’m going to the Scala Days 2016 in Berlin. This is the first conference of this kind I will attend. Maybe I would have preferred a conference about C++, such as c++con, but this is what I got. And, as a second thought, Scala has nothing to envy to C++, at least in terms of unfriendliness and unreadability. In Scala I like that I am not forced to use Java when programming for the JVM, but I find that by looking at the pro and weakness of the existing languages, EPFL could have designed the language somewhere more … Industrial. Instead it felt in several pitfalls, first of which is the misconception that the speed of developing software is capped by the speed of typing the code. Anyway, here I am waiting for the conference to begin. Keynote speech will be from Martin Odersky voice. Martin is, of course the inventor of Scala language and, if I understood correctly, a cofounder of lightbend (was Typesafe) the for-profit company that backs up Scala and its environment. Scala is not meant so that you write “less code”, but rather so that you can concentrate to the “what” rather than to the “how”. I’m thinking for example when you need to manipulate a collection. In Java, as in every imperative language, you have to concentrate on how to navigate through the collection to manipulate it. In Scala, as in any functional language, you just navigate through it. And this is just a simple example. When I started using Scala, I quickly realized that I completely avoid all those trivial errors that I always do when writing the usual boilerplate. How relieved I was! And also, as a side effect, you write less code. It’s amazing when comparing a java and a Scala implementation of the same problem, to see how shorter and more readable is the Scala version!